Home Logistics Outsource Is Transport & Logistics Apprenticeship Provider Of Year. Outsource Vocational Learning has been recognised as Apprenticeship Provider of the Year for Transport & Logistics. With more than 20 years’ experience in the sector, Outsource was chosen for its role in developing new apprenticeship standards and partnering with large and small businesses to ensure apprentices are integrated seamlessly to meet operational needs. 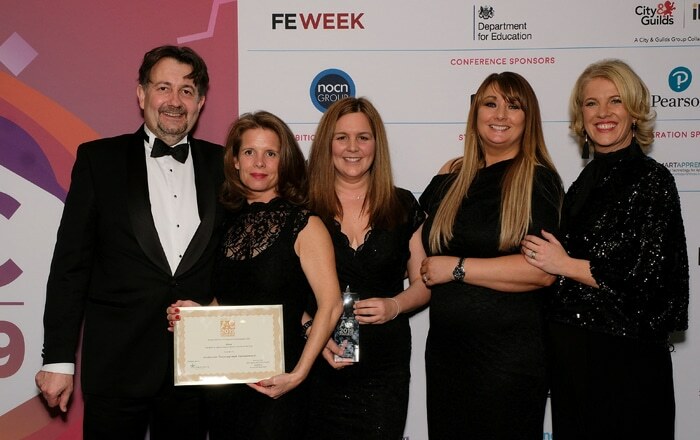 Outsource, part of the Seetec Group, was announced winner in the FE Week and AELP AAC Apprenticeship Awards 2019, which recognise excellence in apprenticeship provision. In their second year, the awards attracted more than 350 entries, with a range of new categories celebrating 13 individual apprenticeship routes. Outsource won the Transport & Logistics Award in recognition of its work to raise the profile of the sector, as well its work with leading organisations to develop Level 2,3 and 4 Standards for aviation and a series of interactive modules for international freight forwarding. Seetec Group also won Business & Administration Apprenticeship provider of the year for its work at the forefront of developing the Business Administrator Standard and leading the way in helping large employers to Leverage their Apprenticeship Levy. Melanie Nicholson, Seetec’s Executive Director for Excellence, Apprenticeships and Skills, said: “We design the programme with employers and support them to prepare both managers and apprentices, providing flexible delivery options to maximise success. Anyone interested in launching their career in the transport industry should contact apprenticeships@seetec.co.uk, telephone 01702 208270. Employers interested in recruiting apprentices should contact Seetec on 0800 3891 999, email employers@seetec.co.uk.